Air ducts are associated with your heating, ventilation and air conditioning (HVAC) system and are the pathways for heated or cooled air to travel throughout a home. Air duct cleaning is the process of removing dust and other contaminants that accumulate over time from your air ductwork. Air ducts are like the circulatory system of your home, which is why air duct cleaning is so important! Since ductwork is often located out of sight behind walls or above ceilings, maintenance like cleaning of air ducts can be easy to neglect. Many people often forget to have routine air duct cleaning performed, which has the potential to cause long term problems with indoor air quality. WHY CALL ADVANTACLEAN FOR CLEANING OF AIR DUCTS? AdvantaClean is the premier provider of duct cleaning. Our trained and professional technicians perform thorough cleaning of air ducts, eliminating contaminants in your ductwork and indoor air, like dust, mold and bacteria. Duct cleaning also helps prevent excessive home dust and allergies from dust by removing those irritants from the walls of your ductwork. 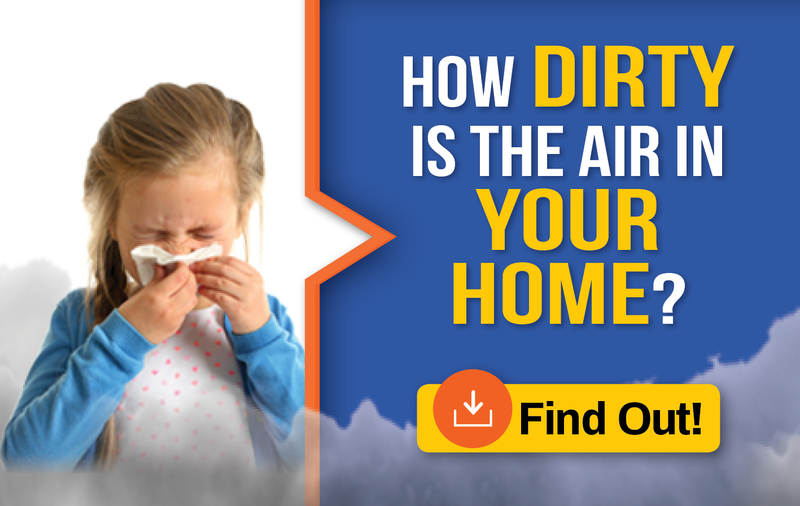 You might be surprised to find out how much dust is in the home. According to NADCA, up to 40 pounds of dust is created annually through everyday living! Your HVAC system recirculates air five to seven times per day, so dust in the home and other air pollutants are pulled into your air ducts, attaches to the walls and builds up over time. Cleaning of air ducts helps maintain healthy indoor air quality in your home. 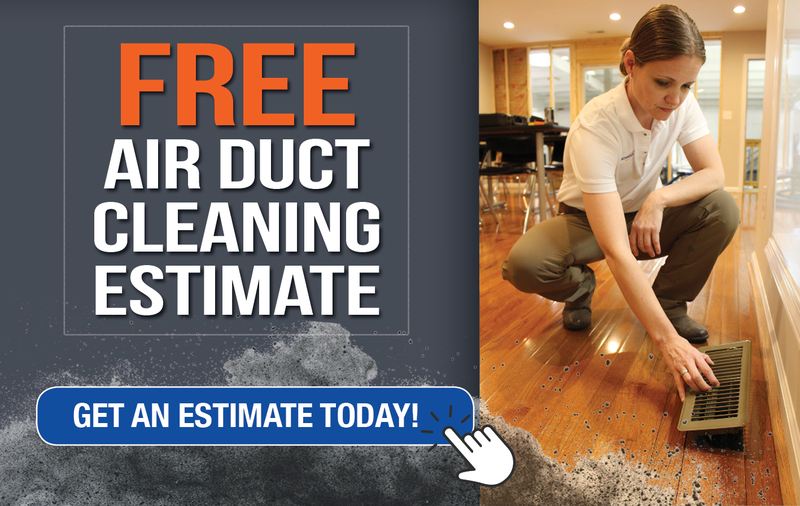 Call AdvantaClean for air duct cleaning if you notice that you need to sweep and dust more than usual. Call AdvantaClean if you experience higher than normal utility bills – cleaning of air ducts can improve your system’s efficiency. Call AdvantaClean when allergy signs appear, especially after air starts to flow – cleaning of air ducts can remove particulates such as mold and dust, which are known triggers. Call AdvantaClean if rooms in your home have little or no air flow coming from the air conditioning vents – cleaning of air ducts will help restore air flow throughout your ventilation system. DUCT CLEANING: HOW TO – WHAT IS DUCT CLEANING? Air duct cleaning is the process of eliminating dust, mold and other contaminants from your heating and air conditioning system ductwork. Air duct cleaning can also greatly improve your home HVAC system’s efficiency. When your air ducts are clean and air is flowing freely, your HVAC system does not have to work as hard and less power is used, lowering your monthly energy bills! DUCT CLEANING: HOW TO CLEAN AIR DUCTS ACCORDING TO NADCA STANDARDS. AdvantaClean follows the rigorous standards set forth by the National Air Duct Cleaners Association (NADCA) when performing air duct cleaning. Our crews will show up at your home on time, in an AdvantaClean branded vehicle. Your home will be prepared for air duct cleaning, ensuring that all vents and returns are accessible, and placing protective flooring covers and corner guards where necessary. After the duct cleaning process is complete, we will seal the access hole in your main trunk line with a metal access panel, according to NADCA standards. Use the calculator below to receive a ballpark estimate. To receive a more detailed quote please fill out the form below and someone will contact you.